Virginia Woolf said, "A woman must have money and a room of her own if she is to write fiction." After five years of shared kitchens, I'm finally back in my own space. One hundred and seventeen square feet of butter-tiled, oak floored hearth on Lexington Street, in San Francisco's Mission district. A Wedgewood stove, eleven Le Creuset pots, a Meyer lemon tree, and the pleasure of breaking my own dishes. Did I dream this book? Update: Metafilter found it. 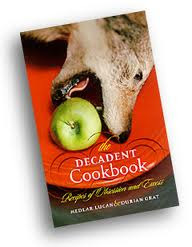 The Decadent Cookbook is found as well. On first read this book, purchased from the dusty shelves of Community Thrift several years ago, appalled me. Chapter after chapter of recipes for things that should never be eaten. Women, rare birds. Wolves. Unspeakable things. There were two male authors with obvious pseudonyms. It was published by a small press, a paperback. A wolf on the cover, with a green-skinned apple between it's teeth. It looked innocuous. The conceit of this assumed work of fiction is that the authors sought ever more fantastic dining experiences, and they recorded their feast preparations. What book you ask? No idea. Maybe the title contained "omnivore" and perhaps not. The clever pseudonyms have flown my grasp. It is not on the stack by my bed. 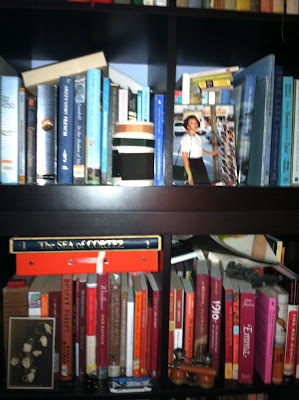 Not on the three shelves of cookbooks, the ones I can'y bear to have too far from the kitchen table. Nor on the ceiling-tall shelf of books less-about-food, or on the built in shelf of books by the window with their spines protectively turned in. Not at the bottom of the stairs where I banished my books about museums and art and culture, and how those things inform community. Where are you strange book? Not listed in my Goodreads. 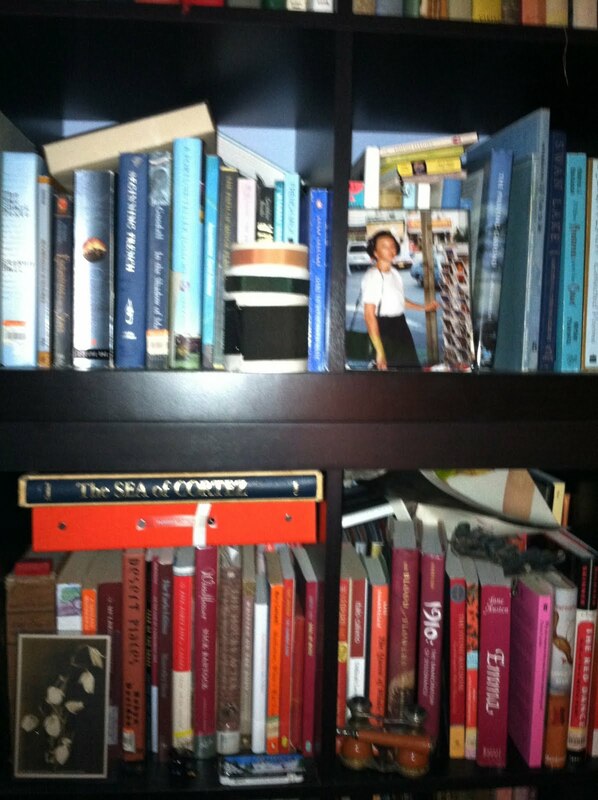 Not captured in photos of bookshelves. Added in and then apparently removed from lists of favorite books in online dating profiles. You inspired this dinner for 21 in my studio flat, and this one which sleeps 'til spring, and this one under the lemon tree, but I didn't give you a peep of credit. Nary a trace of you on the Internet in searches of words and images and books. Amazon has not a whiff of you, Citations contains nothing. Omnivore Books and Kitchen Arts & Letters fail to have their bells rung, though both listened with great kindness to my increasingly unbelievable pursuit. Do you yet exist, book? Did you ever? Are you lost on a beach, or in the seatpocket? Did I leave you in a cafe or on a nightstand? Who did I pack you off with? Who still needed convincing, after my wooing them with a thousand tiny dinner dishes? Whose nightstand are you on now? How to Be a Bon Vivant. Eat well always, even when you have nothing.